Worrying about your air ducts is not the number 1 priority on a homeowner’s to-do list. When it comes to ducts, they’re there to serve a purpose and then out of sight is out of mind. However, there will come a time when you need to have your air ducts on the forefront of your mind. If you have neglected duct repair or even general duct cleaning, you will be in for a costly ride. Why Is Duct Repair So Important? Your ductwork is important as it allows cool and hot air to flow freely throughout your house depending on the temperature you set your HVAC to. Remember that your air ducts work in conjunction with your household HVAC system in order to cool or heat various rooms in your house. Thanks to air ducts you don’t need to install an HVAC unit in every single room, and you are able to adjust the temperature in your home to suit your specific needs. If you neglect duct repair, especially with summer around the corner, you’re not going to have the greatest of times. Your duct system not only ensures that you’re safe from the summer heat but also affects your indoor air quality. If you have any respiratory problems such as asthma, any unwanted holes in your ducts could lead to more dust in the air, which will agitate your respiratory problems. Ducts that aren’t repaired will cost homeowners more money over time. If your ducts aren’t properly sealed or insulated or if there is even the tiniest of holes which allows air out, you will end up unnecessarily spending thousands of dollars on your utility bill. Your cooled air will escape from the duct and be rendered useless in your attic. In order to compensate for the lack of cool air, homeowners either leave their HVAC running or turn the settings higher, this leads to an increase in your monthly utility bill costs. Repairing your ducts is a much more cost-effective way to ensure that your home remains cool throughout the summer. Regular maintenance will definitely help your cause, as your local HVAC technician will be able to spot any necessary repairs sooner rather than later. No household in Florida could survive without the comfort of cool air. If your ducts are clogged and dirty, your HVAC system will be less effective. Your indoor air quality will also suffer as more dust particles and other airborne pollutants enter your home. If you neglect repairing your ductwork, you will have higher utility bills. The same applies to keeping your ducts clean. If your ducts are clogged your HVAC system will need to work overtime in order to keep the temperature in your home consistent. If your ducts aren’t cleaned and you have any respiratory problems or seasonal allergies, it will have a negative impact on your health. The cleaner the air you breathe, the likelihood of respiratory flareups diminish. Your HVAC system can only do so much to remove air pollutants, dust particles, pollen and mold if it is not clean. Constant use will result in eventual wear and tear. If you aren’t willing to repair your duct work, you will need to get ready to face the cost of replacing your entire households ductwork. 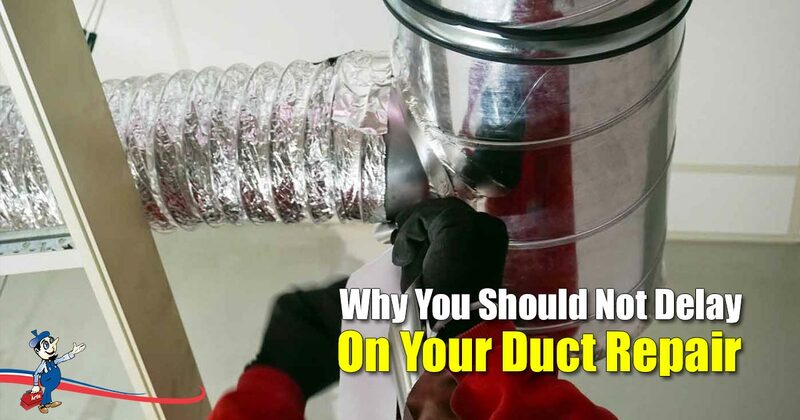 When Do You Know If You Need Duct Repair? There are a few simple signs to keep a look out for when it comes to duct repair. Not everything will make a clanking noise in the middle of the night signaling the need for repairs. If there is visible dust and dirt around your air vents. Remember your HVAC system is meant to remove unnecessary dust and dirt particles, if these particles are visible around the vents it’s time you call in a professional to take a look. This has been mentioned a few times, but if you notice your utility bill is costing you a sizable few dollars more than in previous month, you may want to call in an AC technician from Art Plumbing, AC & Electric. Pro Tip: Rather call a professional to fix any holes in your duct work, duct tape will not resolve the issue. If your duct work is making awfully unsettling sounds, you’re going to want to get that checked out ASAP. Don’t Delay, Get your Ducts Repaired Today! If you have any issues with your air duct repair, remember Art Can Fix It! The team at Art Plumbing, AC & Electric are no strangers to duct cleaning, repair or replacement. If you’d like to find out more about our duct repair services, give us a call at 1-800-475-1504.